Edible snail found in canned snail. It is a good source of low fat high quality protein. Can be eaten with butter. Contains more cholesterol than beef liver. 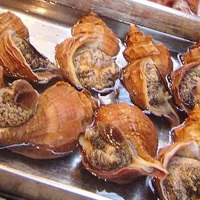 The essence of escargot is used in cosmetic skin care products. The calories in Escargot per 12g(1item) is 10 calories. Escargot is calculated to be 82Cal per 100 grams making 80Cal equivalent to 97.56g with 1.98g of mostly protein、0.12g of fat、0.1g of carbohydrates in 12g while being rich in vitamins and minerals such as Copper and Calcium.